Environmental pollution, particularly that caused by the presence of heavy metals in wastewater, is a serious problem. Therefore, heavy metals should be prevented from reaching the natural environment or removed from polluted wastewater. Adsorption is a very economical, simple, effective, highly versatile process for removing harmful pollutants from wastewater. In this study, six commercial activated carbon (AC) samples were used to evaluate the adsorption of Pb2+, Ni2+, and Zn2+. We investigated the correlation between the adsorption of metal ions on AC and the pore or surface properties of AC. Large quantities of ions in the order [Pb2+] >> [Zn2+], [Ni2+] were adsorbed on all AC samples. 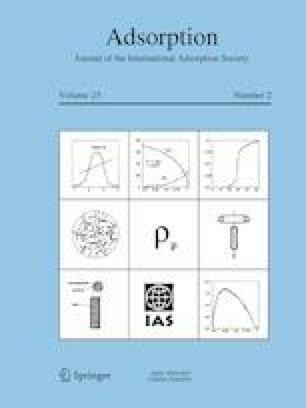 The results showed that the Pb2+ adsorption capacity per unit Dubinin–Polanyi (DP) surface area (SDP) is correlated with the graphite/defect (G/D) ratio of AC; the G/D ratio was analyzed via Raman spectroscopy. The adsorbability of Pb2+ on AC per unit SDP was higher in AC with a larger G/D ratio. Moreover, we found that hard and soft acids and bases contribute to adsorption. The observed correlation facilitates the determination of the adsorption capacity of Pb2+ on AC using the G/D ratio without any adsorption test. The online version of this article ( https://doi.org/10.1007/s10450-019-00069-7) contains supplementary material, which is available to authorized users. This work was partially supported by the Japan Society for the Promotion of Science, Grant-in-Aid for Challenging Exploratory Research, Grant No. JP16K14461.